Genres: Contemporary Romantic Suspense, Mystery, Paranormal, Fantasy, Historical. I have always loved to read and constantly made up stories in my head. Something clicked one day and I started writing them down. My first love is Romantic suspense, I have adored Linda Howard for many years. But I am an avid reader of most genres, devouring anything sci-fi and fantasy when I was a kid. I met Anne McCaffrey when I was about 20 and it remains one of the highlights of my life. 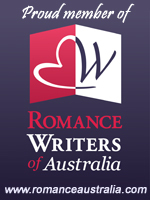 The RWA has been and continues to be a wonderful experience for me. The things I have learnt since joining have been invaluable.